If you want to watch both videos now, though, they are available as a video download as part of my new Latest in Clinical Nutrition volume 27 (all proceeds go to charity). It can also be ordered as a physical DVD. The calcium videos are both scheduled to go up on NutritionFacts.org in November, but you can download and watch them right now. Other videos included in the volume that I expect may be popular include Should We All Get Colonoscopies Starting at Age 50? and Find Out If Your Doctor Takes Drug Company Money. 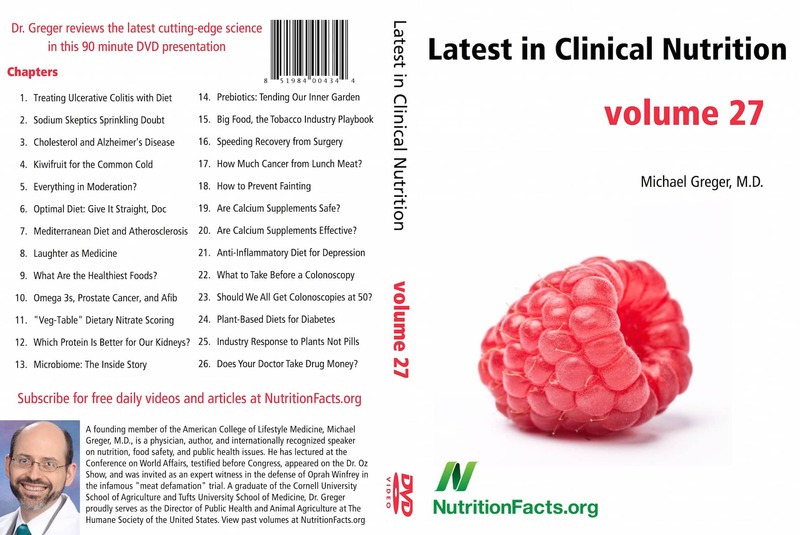 The current batch of videos from volume 26 on NutritionFacts.org just ran out, so starting this month and running until December, I’ll be rolling out the videos from this new DVD, volume 27. The DVDs give folks the opportunity to sneak-preview videos months ahead of time, watch them all straight through, and share them as gifts, but there is nothing on the DVDs that won’t eventually end up free online here at NutritionFacts.org. If you’d like the works–50+ hours of video–you can get the complete DVD collection. If you were a regular supporter, you’d already be a calcium (and colonoscopy!) expert by now, having already received the new DVD. I come out with new DVDs every 9 weeks. If you’d like to automatically receive them before they’re even available to the public, please consider becoming a monthly donor. Anyone signing up on the donation page to become a $15 monthly contributor will receive the next three DVDs for free (as physical DVDs, downloads, or both–your choice), and anyone signing up as a $25 monthly contributor will get a whole year’s worth of new DVDs. If you’re already signed up and didn’t receive your volume 27 yet, please email Tommasina@NutritionFacts.org and she’ll make everything all better. If you’d rather just watch all the videos online as they launch, but would still like to support my work of helping to educate millions about healthy eating, you can make a tax-deductible donation to my 501c3 nonprofit organization NutritionFacts.org using a credit card, a direct PayPal link, or by sending a check to “NutritionFacts.org” PO Box 11400, Takoma Park, MD 20913. Thanks to the extraordinary response to the upcoming publication of my magnum opus, pre-orders shot How Not to Die to #8 on Amazon! If you have not pre-ordered it yet, then go to http://www.NutritionFacts.org/book . If you haven’t pre-ordered it for everyone on your holiday gift list yet (it comes out December 8!) then please pre-order more! 100% of proceeds I receive go directly to support my 501c3 nonprofit NutritionFacts.org. You can also enter to win a pre-order contest! Details at http://www.NutritionFacts.org/book . It is so validating to see pre-order sales climb and realize how deeply my work is valued. I’m so excited for everyone to get it and see what I’ve been up to all year! Hello! Can I enter the sweepstakes for as many times as I pre-order a book? I already pre-ordered one in August, but am thinking about pre-ordering a bunch more for family members for Christmas presents. Emily: I asked the same question. I pre-ordered 10 books so I could use them as gifts. According to the staff person I spoke to, the rule only allows for one entry per person. :-( I’m still happy I ordered the books. I just thought the extra entries would have been fun. re: ” #8 on Amazon” WOW!!! That’s just so, so exciting. I’m very proud to be part of this effort. This is real a win for humanity.